I stopped off on my way home from work the other day to catch a screening of Fast Five. It was a Tuesday, so the ticket was half price. I guess I’d have to say I got my money’s worth. I’d only previously seen the fourth movie in the series, Fast & Furious (also directed by the talented Taiwanese filmmaker Justin Lin, responsible for the excellent Better Luck Tomorrow ), so only had a vague idea of the overall backstory about the feud/friendship between Dom (Vin Diesel) and Brian (Paul Walker), respectively the fugitive and the cop more or less pursuing him. By the time of the current episode, both men are on the run from the law, but they are, of course, the good guys. There’s a vague “noble outlaw” element to the series as Dom generally commits his offences in pursuit of really bad guys. 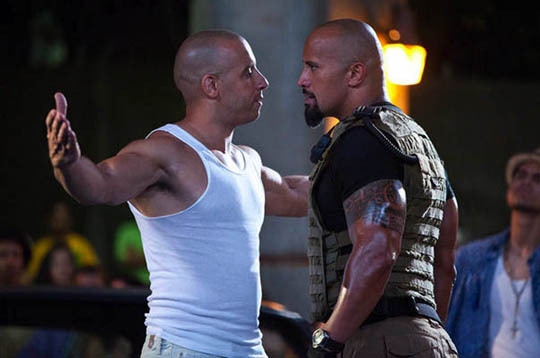 Fast Five is slick, reasonably well-paced entertainment, the superficial character conflicts periodically interrupted by large-scale, car-focused action sequences shot in Rio. With Dom and Brian teamed up to deal with a mega-crime lord who rules the city’s slums and owns what appears to be the entire police force (except for one dedicated policewoman), a new lawman is required to keep the heat on them as they carry out their plan to steal $11,000,000 in drug money from the suave Hernan Reyes (Portuguese actor Joaquim de Almeida). Enter Dwayne Johnson as arrogant fed Luke Hobbs who treats the Brazilian authorities with contempt as he and his team attack the slums with machine guns and armoured assault vehicles. My only minor complaints would be that not enough emphasis is put on the planning of the big heist (I’m a huge heist movie fan and the core of the fun is in seeing all the details worked out, and then seeing how the team adapts when things go wrong), and The Rock isn’t given enough screen time (though there’s a great warehouse-devastating fist-fight between him and Vin). That, plus the fact that there are almost as many endings as The Return of the King (including a final, mid-credits teaser for the next episode). Coming out of the theatre, I got to wondering what had happened to Vin Diesel. He’s made a pretty successful career by offering up a thick-skulled persona possessed of very little personality. The weakest aspects of the movie are the “sensitive” scenes where he goes on about the value of family – apparently the family that drives together, thrives together. So I dug out my copy of Short 5 (1999), one of a series of DVD “magazines” released by Warner Brothers back in the early days of the format when distributors were still experimenting with the medium’s possibilities. 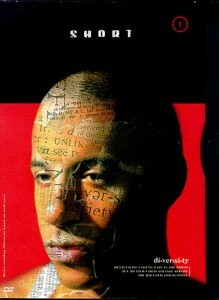 Volume five offered the remarkable short film Multi-Facial (1995) which Diesel wrote, directed and starred in when he was 28. (The film is viewable on YouTube here.) 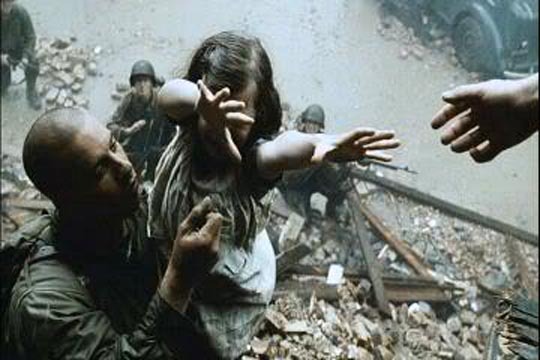 It played at Cannes and led to Steven Spielberg hiring the actor for a role in Saving Private Ryan (1998), and to Brad Bird hiring him for the voice of the Iron Giant (1999; there’s a short feature on the disk with Multi-Facial about the voice recording for Giant, illustrating Diesel’s facility with vocal nuance). Although I had already seen Ryan, Giant and Diesel’s subsequent career breakthrough Pitch Black by the time I came across Multi-Facial, it was this short that indicated degrees of talent as yet untapped. It’s a sharp, self-aware, emotionally resonant piece about an actor making the rounds of auditions, painfully exposing himself in front of bored, insensitive casting directors who are confused by the actor’s lack of ethnic specificity. 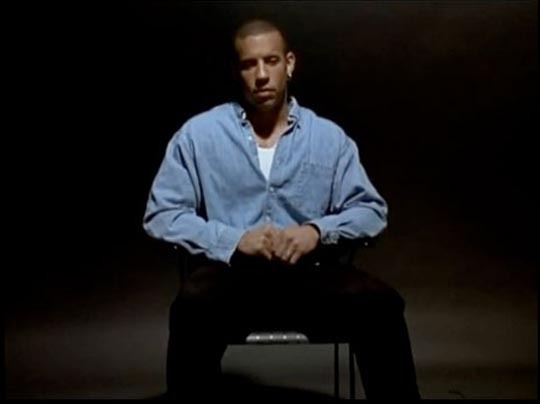 Diesel, as Mike, appears to be Italian in one situation, light-skinned black in another; he comes across as a crude, violent thug one moment and as a quiet, introspective artist the next. It’s a terrific piece of writing which permits Vin to showcase the range and subtlety of his acting talent, while at the same time foregrounding the unsettling ambiguity of his background which paradoxically makes it seem (to those casting directors) that he’s not really acting at all. As he tells his agent over the phone after the initial audition, they probably thought he really was a misogynistic, homophobic jerk. Multi-Facial is a brilliant piece of self-reflection/self-creation, both an expression of Diesel’s determination to make it as an actor and the proof that he has the talent to achieve his goal. And yet, despite the talent on display, the underlying problem the film exposes – an industry so dependent on clearly identifiable types would inevitably have problems with his racial and ethnic indeterminacy – has apparently pushed Diesel into the persona we now know; what place could be found for him except as a violent outsider in superficial popcorn movies? 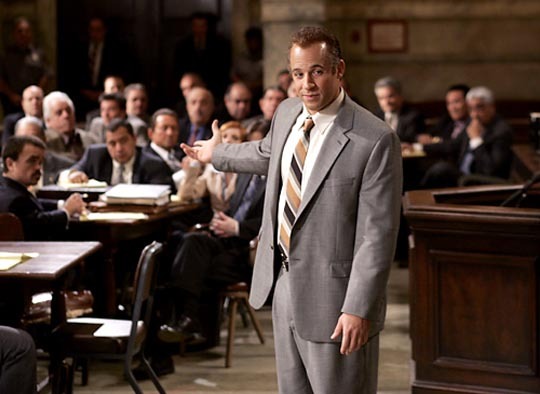 After Ryan, Giant and Boiler Room, the only opportunity Diesel has had to break out of that caricature was when the late Sidney Lumet cast him as the star of Find Me Guilty, and Vin took full advantage of the opportunity, tearing into the role of a small-time hood who defends himself in court against the wishes of his bosses. 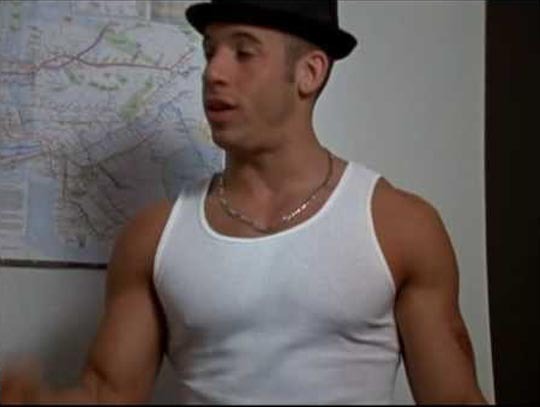 It seems apparent that, despite the talent shown in Find Me Guilty and Multi-Facial, the inability of the industry to come to terms with the strange indeterminacy of Vin Diesel’s identity has forced him into that now familiar cartoonish persona, which ironically has actually brought him the success he was hoping for … at the cost of suppressing significant aspects of his talent. 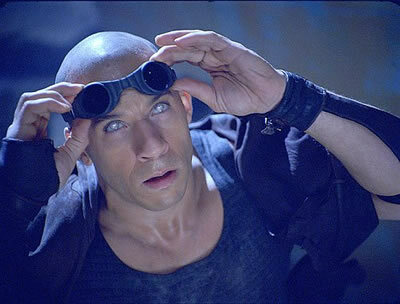 This entry was posted in Commentary and tagged Actors, Short Films, Vin Diesel. Bookmark the permalink.